Everything used to seem so final, inevitable, predestined. But now I'm starting to believe that life may have more surprises in store than I ever realized. Maybe it's all relative, not just light and time like Einstein theorized, but everything. Like life can seem awful and unfixable until the universe shifts a little and the observation point is altered, and then suddenly, everything seems more bearable. 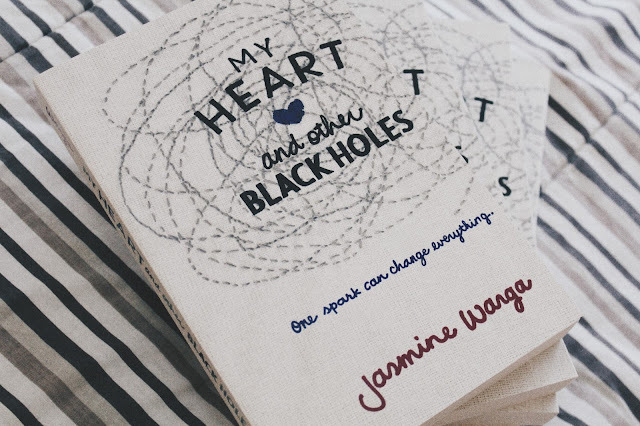 It's been a while since I've read anything fiction and I'm glad I stumbled upon My Heart and Other Black Holes by Jasmine Warga. The funny thing is, I only bought this book because I thought the title perfectly sums up my personal drama. (in Filipino: hugot) If you're a regular on this blog, you'd know that I often purchase books without checking the summary on the back or cover flap first. So imagine my surprise when I discovered what this book is actually about! Now, I've never been depressed and I don't know anyone personally who's been in a similar situation but with the way Warga presented Aysel's story, it wasn't hard for me to feel for her. I completely understood how she felt and why she wanted to end her life. Her backstory’s really intense but none of it felt like the author was dumping tragedy onto her to make the depression believable. Because, you know, quite a lot of books have that. And it gets annoying. Hashtag drama? Aside from that, I liked the dynamics between Aysel and Roman. I thought it was interesting from the moment they met. They spoke about their plans casually but you can feel the weight of their troubles nonetheless. If it's even possible, I don't think I felt any sort of sadness while reading the book. Even Aysel’s philosophy on and questions about death were easy to take in. Warga’s writing is effortless and effective. I guess the only thing that didn't quite work for me was the ending. I won’t spoil it for everyone but the gist is: I needed the end to be fleshed out more. For a book that deals with something so heavy, the resolution felt a bit hurried. But hey, overall, the book is enjoyable despite the theme. It’ll entertain you but at the same time it’ll invite you to see the bigger picture through the eyes of two people going through something that someone you might know is experiencing. A book that can do both is definitely a keeper. Listen up, nerds! I have four copies of this book to giveaway (thanks Fully Booked!) and one of them could be yours! All you have to do is enter the raffle below and you're set. 2. Winners will be notified via email. Winners have 48 hours to respond before another one is chosen. 3. This giveaway is only for PHILIPPINE RESIDENTS. 5. Pro-tip: You can tweet once everyday. Keep tweeting everyday to get more raffle entries. My Heart and Other Black Holes by Jasmine Warga is available in Fully Booked.